From early April to early June, I’m featuring short interviews with the authors of the six shortlisted titles for each of the three awards run through The League of Canadian Poets – the Raymond Souster Award, the Gerald Lampert Memorial Award and the Pat Lowther Award. Today’s feature is North Vancouver poet Russell Thornton, whose book Birds, Metals, Stones and Rain (Madeira Park BC: Harbour Publishing, 2013) is on the shortlist for the 2014 Raymond Souster Award. See my previous Raymond Souster Award shortlist interviews with Anne Compton, Jenna Butler, Vancy Kasper, Catherine Graham and John Terpstra. The winners to all three awards will be announced on Saturday, June 7, 2014 at The League of Canadian Poets 2014 Annual General Meeting in Toronto. Russell Thornton’s latest book, Birds, Metals, Stones & Rain (Harbour, 2013), has been shortlisted for the Governor General’s Award for poetry, the Raymond Souster Award, and the Dorothy Livesay BC Book Prize. His previous books are The Fifth Window (Thistledown, 2000), A Tunisian Notebook (Seraphim, 2002), House Built of Rain (Harbour 2003), which was shortlisted for the Dorothy Livesay BC Book Prize and the ReLit Poetry Award, and The Human Shore (Harbour 2006). 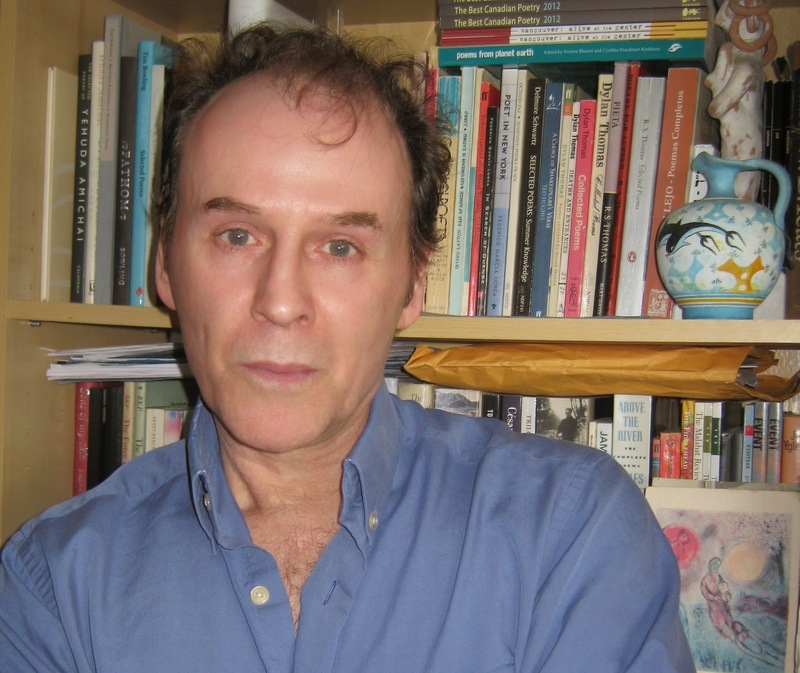 His poems have appeared in a number of anthologies, among them Rocksalt: An Anthology of Contemporary BC Poetry, Open Wide a Wilderness: Canadian Nature Poems, and The Best Canadian Poetry in English 2012. He has a book coming out in the fall of 2014 called The Hundred Lives (Quattro Books). He lives in North Vancouver, B.C. 1. Birds, Metals, Stones and Rain is your fifth trade collection of poetry, after The Fifth Window (Thistledown, 2000), A Tunisian Notebook (Seraphim, 2002), House Built of Rain (Harbour, 2003), shortlisted for the ReLit Poetry Award and the Dorothy Livesay Prize (BC Book Prizes), and The Human Shore (Harbour, 2006). After nearly half a dozen trade collections over the space of a decade, how do you feel your concerns as a writer have developed? How do you feel the work, and even the process of writing, has evolved? My particular set of inclinations hasn't changed dramatically since I began producing my poetic efforts. Actually, I wonder whether a writer's concerns ever really change all that much -- there is only so much an individual psyche can negotiate on the artistic level. Well, apart from Shakespeare. But then it could be argued that even Shakespeare had a limited number of concerns, and that his concerns were on display right at his beginnings. I suppose I'd say that what evolves in a writer is what a writer does with his or her concerns. If my procedures haven't changed over time, hopefully I've gotten at least a little better at the procedures. I know I’ve never been interested in innovation for innovation's sake, or theory to any extent (I can't use it); I've simply been interested in being as true as possible to my experience and whatever imagination I may possess, and in locating the place where the two -- experience and imaginative language -- might meet properly in a lyrical piece. Earlier on, I may have been speaking to individual people, real or imagined, as addressees in poems; now I like to think I'm speaking more to everyone -- even though the subject matter might still be personal. I go back to my personal pantheon of poets: Shakespeare, Blake, Yeats, D.H. Lawrence. Then there’s R.S. Thomas, Elizabeth Bishop, Galway Kinnell, Michael Longley. Then there are non-English-language poets: Yehuda Amichai, Cesar Vallejo, Rilke, Lorca, Octavio Paz, Janos Pilinszky, Celan, Antonio Machado, Czesław Miłosz, Tadeusz Rozewicz, Cavafy, Sohrab Sepehri. Of course, there are Canadian poets: Layton, A.M. Klein, Alden Nowlan, Don Domanski. The work of all these poets never stops teaching me, wounding and at once healing me, inspiring me. 3. After spending stretches of time living in Wales and Greece, you’ve lived in North Vancouver for quite some time, as well as originally being from there, and I’m curious as to how the community of writers around you, as well as the variety of landscapes in which you have lived, have contributed to your work. Do you think you might have been a different kind of writer had you lived in another part of the country? Wales left in me a sense of a certain melting pewter turned to raying light, and a music a bright silver- and night-edged rhyming stream -- as if the Mabinogion had poured straight into my skull. I feel very at home in Aberystwyth, especially -- the landscape, the sounds of the two different speeches around me. Greece left in me that stark white light, and that deeply wild music and set of gestures direct out of Indo-European origins; that immense frenzy come into strict form and reserve and silent containment, as at the moment of the morning of the world. I think of places in mid and northern Greece (I lived in Larissa and then Thessaloniki for three, four years and have returned a number of times) and several islands, and I feel a piercing nostalgia. I found that Greece tests a person; the way the culture inhabits the air, it forces you to come up with exactly who you are. You can’t do otherwise, as in the circumstances in which characters find themselves in ancient Greek drama. As much as these two places, and others outside Canada, have affected me, I’m nothing if not a North Vancouver poet. My grandparents came here from four different countries -- and couldn’t leave. I left -- but couldn’t help but come back. The non-human environment here is full of movement, quick change, and pure vitality, and it incites transformational experience. I wonder sometimes if I would have written poetry at all if I hadn't come from this place. My whole life, I've had in my ears the local rain sounds, the creek and river sounds, the foghorn bellowing of the ships in Burrard Inlet, the seagull cries. I’ve imagined I could hear the fir, hemlock, and cedar presences, not only as wind moved through them, but also as they drew water up into their roots and trunks. Watched rainclouds glide across rooftops, river-mist pour down the river canyons. Watched the air light up, the trees and grass light up, as if for the first time after rain. In a part of myself I think I’ll always be looking west, out beyond the Lions Gate Bridge towards Georgia Strait. Out there, the sun is shining brightly, but here in North Van it's raining steadily -- so that the light is arriving as if through enormous vaulted windows. The mountains sit close, over my shoulder, gathered there like brooding gods. 4. In Bruce Hunter’s review of Birds, Metals, Stones and Rain posted at Canadian Poetries, he speaks of your writing in terms of being composed by someone “who lives not in a place, but through it[. ]” How do you feel about this description, and how important is geography or “place” to your poetry? Do you know those lines from The Marriage of Heaven and Hell ? Blake says “the whole creation will … appear infinite and holy whereas it now appears finite & corrupt. This will come to pass by an improvement of sensual enjoyment." I take this to mean, on one level, that whatever visionary capacity is available to human beings, it is connected with the fullest experience of the senses. But Blake also said, in Auguries of Innocence, “We are led to believe a lie/ When we see not thro' the eye,/ Which was born in a night to perish in a night,/ When the soul slept in beams of light.” I can’t say whether Bruce Hunter meant his comment to call up Blake -- but I like the comment because, among other things, it conjures Blake for me. I’ve always felt that to live very much in a place is to live through it into another life -- another life tied only in ineffable ways to a particular geographical locale. I've been in and out of bits and pieces of various kinds of teaching work, but my main job for a long time has been in building and property maintenance; it’s included janitorial work, repairs, renovations, yard work. Over different periods, it’s meant having my own small businesses. So I've done mostly menial and semi-skilled work for much of my life. This type of work has given me a number of poems, possibly leant a texture to my writing too -- I'm not sure. Teaching is an honourable profession, I feel. I've really enjoyed the opportunities I've had to teach. I guess for me teaching is a caring, helping profession; and the fact of that has to influence your writing life. I figure anything that takes you into the wider community of human beings is beneficial for whatever you want to try to write. Also, I've liked having to re-read literary works with an eye to helping others think about them, write about them. Hopefully it's bettered my own poetry. In the end I don't think poetry will allow you to compartmentalize your life all that much -- not in your deeper traces anyway: your income getting is going to infiltrate your poetry. Well, I've enjoyed the free dinners and free wine I’ve had at awards galas and awards promotion reading events. I hear and read a lot of complaints from people about awards -- but I don’t dwell on awards, to be honest. Serious poetry is such a marginal art in the contemporary world, I think it can only be a good thing when poetry gets attention. It’s as simple for me as that. On the personal level, my dream was always to get published in book form. To use a word Raymond Carver used in one of his poems, everything else is “gravy.” If a random couple of people acting as judges for an award put me on a shortlist or make me the winner of an award, that’s marvellous -- I’ll crack open the champagne and thank the gods. If they don’t, I’ll still crack open the champagne. By that I mean inner champagne -- every time I come up with what I figure is a half decent poem, in a part of myself I celebrate. Writing is its own reward.